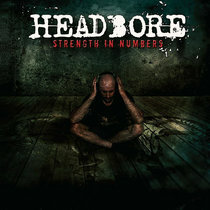 Headbore is the kind of roaring heavy metal band who brook no quarter, filled with vicious riffs, deranged growls, and a wonderful dedication to all things heavy. Further evidence that the Australian scene (Especially that around Adelaide) is one of the best in the world, Headbore are bringing metal madness to the masses. Their new record Strength in Numbers clearly evidences the music skill they have. With elements of Lamb of God in the growls and touches of old school death metal in the riffs Headbore take some clear influences. Yet they still have a distinct musical direction with their own sound. Their is a certain immensity to their bottom end which shows how the band has the power to drive on no matter what. The best example of this crushing power is on the chorus of Sacrifice which has a crushing death metal chug. As a whole, this Australian quintet is not to be taken lightly and one day we may hear of the Fisher brothers in the same vaunted terms currently reserved for the Hoffmans or the Adler's.